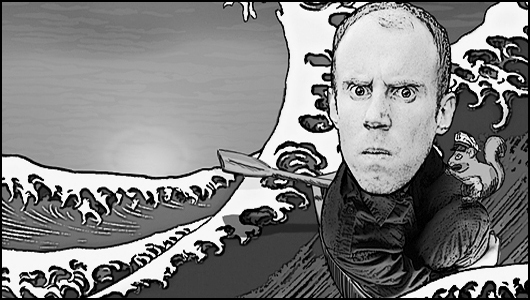 Review: Dave McNeill: Canoe Ride 300 – Pleasance Cellar, Edinburgh. Lean, agile Dave McNeill almost looks as if he could be a BBC funded adventurer or wildlife presenter: the sort who you’ll usually see slowly paddling a canoe up the Amazon wearing a sand coloured survival jacket, while talking in hushed tones about how easy it is to make your own shoes from bits of tree bark. However, just a few minutes into McNeill’s debut hour, it becomes quite clear that he probably wouldn’t receive that BBC funding – due to the fact he has the chaotic, disjointed mind of a hyperactive four year old. The basic premise for this show is that Dave has just been dumped, rather entertainingly, by a recorded voiceover of his girlfriend. (The lengthy list of reasons she gives includes, “You sweat too much for a thin man.”) Free from the chains of his relationship, then, he decides to travel to China, in a canoe made from black paper and a desk chair, after catching a Chinese man urinating into his letter box. ..
McNeill’s comedy is essentially a fast paced, surreal – and entirely fictional – version of the travelogue narrative popularised by the likes of Dave Gorman, but because the story telling is so often disjointed it can be difficult to follow at times. But before that laughter has a chance to die down he’ll have already dived headlong into another section or, more usually, he’ll be pulling a member of the audience up onto the stage and insisting they’re a middle aged Chinese dissident called David Chang. He’s nothing if not creative. The pacing – and the focus – of Canoe Ride 300 isn’t quite right yet, but of course it’s early doors here in Edinburgh. And there’s plenty to take from McNeill’s debut solo show. Witty, offbeat gags scatter across the show (“They say that if everyone in China jumped at the same time then it would be an unparalleled coincidence…”), and overall, these genuinely funny moments compensate for the sections that aren’t quite as effective – like a bit where he fabricates a series of ‘facts’ about canoes and canoeing, or re-enacts the Robin Hood legend using a toy squirrel and a keyboard. So if you’ve got a couple of hours spare between shows, or just want to have the opportunity to squirt water at a man who looks like an anorexic, slightly balding version of TV survivalist Bear Grylls, then track down McNeill for an entertaining and energetic debut – and some surprisingly non-confrontational audience participation. Date of live review: Friday 3rd August 2012.